On the portal of discussions of normative-legal acts, the project of the resolution of the State Tax Committee and the Central Bank of the Republic of Uzbekistan "On approval of the regulation on the procedure of unconditional collection of tax debts from plastic cards of individuals" was placed. According to the regulation, a debtor taxpayer's debts are deducted unconditionally from bank plastic cards in the amount of not exceeding twice the minimum monthly wage (MMW). Amount of the MMW is considered on the basis of current the rate for the same month in accordance with the legislation. If the MMW changes, it will be recalculated based on the variable amount. Tax debts of individuals on property, land and taxes calculated based on the declaration of income, as well as individual entrepreneurs, who have lost their entrepreneurship status or whose bank accounts have been terminated, are collected unconditionally. - pensions paid for retired and disabled persons, old and invalid citizens with insufficient working experience. Individuals may be charged for their debts in accordance with their application to the State Tax Service indicating plastic card number. At the same time, the amounts are charged irrespective of the source of funds on the plastic card based on the amount and term of the application. State Tax Committee of the Republic of Uzbekistan will present e-information on the names of debtor taxpayers, their identification numbers, passport data, name of the regional tax department, name of tax and other obligatory payments, tax debt amount to the Central Bank of the Republic of Uzbekistan via a secure communication channel no later than three working days after the expiration of the term of payment of taxes and other mandatory payments. 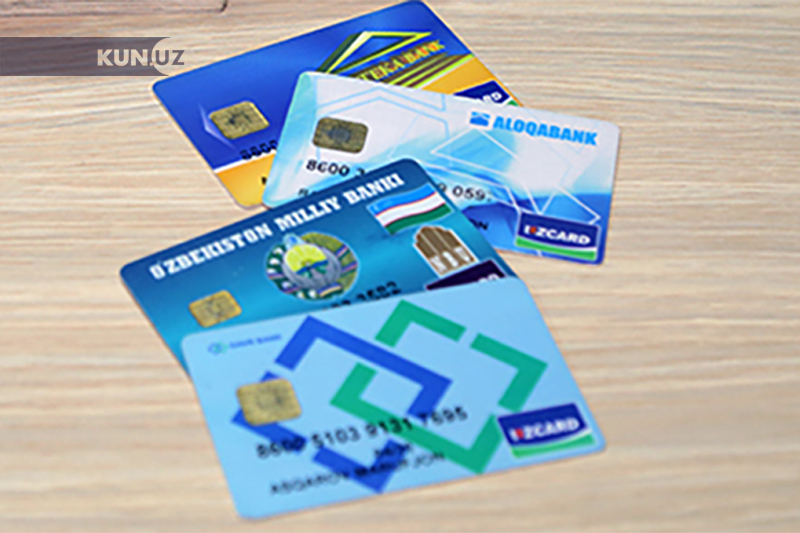 The Central Bank of the Republic of Uzbekistan (CBU) shall define the plastic cards opened on the name of personal identification numbers of individuals in the real time on the basis of electronic data received. Then it will provide information on bank card account and submit it to the State Tax Committee electronically no later than one working day. The State Tax Committee of the Republic of Uzbekistan shall, within three working days from the basis of the received information, formulate an electronic order of collection of tax debts from individuals and send it to the CBU. Upon receiving the data, the CBU instantly direct them to the banks servicing plastic cards of individuals for execution. Service banks will restrict the use of plastic cards of individuals for ten working days and send an SMS to mobile phone numbers that are connected with plastic cards. The SMS indicates the full name of the taxpayer, name of the tax department, type of tax and other mandatory payments, restricted amounts and plastic cards, reasons for the restriction and payment of debts in ten working days, as well as warns that upon expiration of this period he shall be unconditionally charged without consent. The cost of sending SMS is initially carried out by the CBU and is subsequently refunded from the State budget. Within the limits of the amount indicated in the instructions, the full or partial restriction of one or several plastic cards, including plastic cards in foreign currency, may be imposed on the basis of funds on plastic cards. The use of restricted amount of money by plastic card holders is prohibited, except for the sum of excess money. • if the sum of tax debt is fully paid by other sources – by the public tax authority in real time. Upon completion of the warning period, the restricted money on the plastic cards will be directed by the relevant tax authority for paying off the tax debts and other mandatory payments. At the same time, SMS notifications will be sent on the number of connected mobile devices. In case of partial coverage, a limitation is established within the amount of unpaid sum and it can be increased in the following month to two times MMW depending on the amount of the tax debt. It is forbidden to restrict the amount exceeding two times MMW in a month. While opening a new plastic card by individuals, the commercial bank inspects the presence of information about restricting debt amounts for the same subscriber. If the State Tax Committee has submitted a deduction order one month prior to the date of opening the plastic card, the plastic card also will be blocked. If a taxpayer submits application for the payment of taxes for the current year, the tax authority sends an electronic notification to the CBU within three working days from the date of registration. In the content of the electronic collection order the full name of the applicant and date of the application should be indicated. Simultaneously, the restriction on the plastic card should be abolished by the tax authorities. The unconditional collection of tax debts from plastic cards is carried out in accordance with the procedure established by the Central Bank of the Republic of Uzbekistan. Tax authorities should notify the taxpaying individuals on the order of unconditional collection of tax debts from the plastic cards and optional payment on the basis of the submission of personal applications.